1 – The September 17th race at Tucson Speedway will be the 1st time in series history the SPEARS Southwest Tour will compete on the 3/8 mile Arizona oval. 3 – Championship points leader Derek Thorn is shooting for his 3rd SPEARS Southwest Tour Series championship title. Thorn has never competed at Tucson Speedway. 7 – The upcoming SPEARS Southwest Tour Series event at Tucson Speedway is the 7th race of the 2016 championship season. 11 – Keith Spangler has the most Tucson Speedway starts of any active SPEARS Southwest Tour Series driver with eleven. 12 – Twelve drivers are currently on the SPEARS Frequent Flyer Program, which guarantees a minimum of $1,000 to each driver for starting each SPEARS Southwest Tour Series race. 13 – Thirteen rookies have competed in 2016. Christian McGhee has held the Rookie-of-the-Year points lead since the season opener in Las Vegas. 16 – The NASCAR Southwest Tour has competed at Tucson Speedway a total of sixteen times in its series history. 45 – Forty-five different drivers have taken the green flag in SPEARS Southwest Tour Series events in 2016. 70 – Defending SPEARS Southwest Tour Series champion, Jacob Gomes will make his 70th career series start at the Tucson Speedway event. Gomes, 23 will be tied with Scott Sanchez for 4th on the all-time starts list. 540 – There is a maximum of 540 championship points available to a driver over the final three races. This means 11 drivers still have a mathematical shot at the 2016 SPEARS Southwest Tour Series championship. 639 – Total laps run so far in the SPEARS Southwest Tour Series 2016 championship. 1968 – Tucson Speedway was built in 1968, originally as a clay oval. 2004 – October 2004 was the final time the NASCAR Southwest Tour competed at Tucson Speedway; three-time SPEARS Southwest Tour Series champion, Jim Pettit II, won the race. 10,000 – The 2016 championship finale, at The Bullring at Las Vegas Motor Speedway on November 19th, will pay $10,000 to the winner of the race. Thank you to Retro Custom Metals for the bonus to the winner’s share of the purse. Wenatchee, Wash. (August 18, 2016)–During the summer you would find a lot of 17 year olds getting a summer job, hanging at the beach or pool with friends and enjoying the time off, but for Brittney Zamora it’s been a busy summer in the race shop and on track during her Rookie Year of Super Late Model racing. Zamora is entering her senior year at Kennewick High School in Kennewick, WA but when class resumes in a few weeks she can share a “Show & Tell” only a few teenagers could offer. 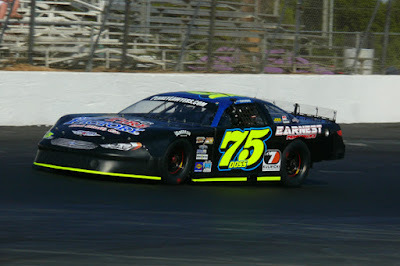 Zamora ranks among the Top-5 in the chase for the 2016 NWSLMS Championship and leads the Jefferson Pitts Racing Rookie of Year standings with three races left in the season. 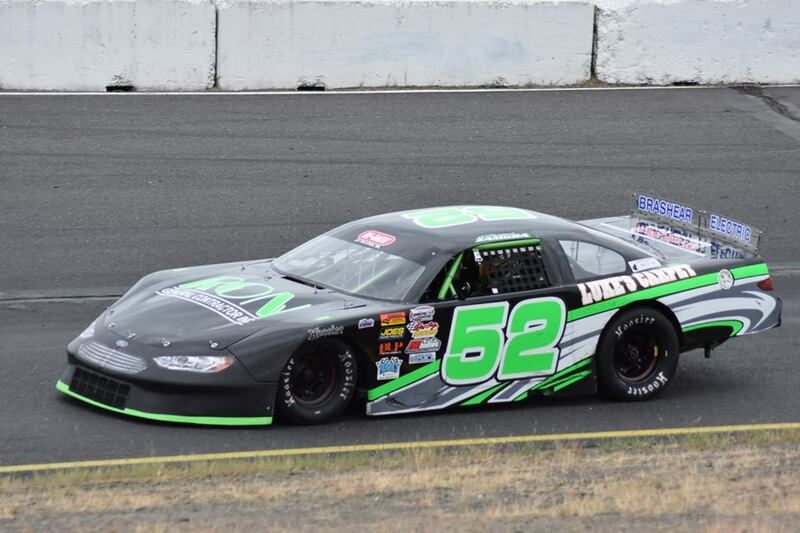 The second-generation driver made the move up this past year from being very dominant in Mini Stock races around the Northwest while also making selected starts in Limited Late Model racing. Zamora has embraced the change to Super Late Model competition, she explained. Zamora is following in the footsteps of her dad, Mike, who was a very accomplished Super Late Model driver himself with multiple wins and a Late Model Challenge Series championship to his credit. When asked if she feels pressure following in her dad’s footsteps the young driver said it has the opposite effect. Her debut season in the NWSLMS has been very strong so far finishing in the Top 10 in three of her first 5 races. While happy with the results so far, Zamora still aims to improve in the closing weeks of the season. With the NWSLMS being involved with some historic races during the year it’s been a special season so far for the youngster. Heading into the second-half of the season Zamora is eager to revisit some of the tracks from earlier in the year. Next up on the list for the number 52, the same number her dad drove in his racing career, is the tricky and fast Spokane Super Oval for the Park Model Homes 125 Presented by CAL this weekend. With the points battle close throughout the top-10 in the championship standings drivers like Zamora, Mitch Kleyn, Braeden Havens and Ed Thomsen will all be looking to close in on Garrett Evans and Ryan Wells in the title chase. Take those drivers and add in heavy hitters like Tayler Riddle along with a very strong local contingent and it shows you why the race at Spokane Super Oval will be a must watch event. Action gets underway Friday with an open practice session for the NWSLMS teams. Saturday features the NWSLMS Park Model Homes 125 presented by CAL main event along with three local classes. Less than a handful of races are left on the 2016 schedule for Redwood Acres Raceway. In fact, only three point paying events remain on the schedule, two for the late model division. As the season winds down, the battle for the track championship in all six local divisions promises to heat up. The California State and Federal Employees Credit Union roadrunner division has a tie atop the division’s standings. Steve Paiment and Tyler Peach are the two drivers racing neck-and-neck for the division crown. Third place, Bethany Rapp will need both drivers to suffer serious issues to find her way back into the fight as she’s 38 points in arrears to the two leaders. Patrick Sproul is only a point behind Rapp in fourth while Dominic Vogelsang is fifth, two points behind Sproul. James Moore has a huge advantage in the Fortuna Wheel and Brake bomber division. Moore has a 74 point lead over John Lally and appears to be a lock for the division track championship barring major unforeseen circumstances. Tyler Avelar is third in points, 93 behind Moore while Ryan Ahrens is a point behind Avelar in fourth. Rookie driver, Kimberly Sorrels is fifth in the standings, 109 behind Moore. It’s a three man race for the title in the Humboldt Hydroponics mini stock class. Gary Klinetobe leads Eugene Palmer by only five points. Jarrett Mayo led the standings for the majority of the season but has suffered two straight races of bad luck which have dropped him to third and 12 points behind Klinetobe. Daniel Buell has been impressive in his rookie season in the division and is fourth in points, 54 behind Klinetobe. Division veteran, Rick Estes is fifth in points, 60 behind the leader. Only four points separate first and second in the Thunder Roadster division. Veteran Tommy Payne leads rookie Ronnie O’Neil. It’s likely that the championship in the division will go down to the wire between the two drivers as they have finished near each other in nearly every race this season. Donnie Brown and Aaron Byers are 25 and 28 points behind Payne and though they are still in the point fight, it will take issues by both leaders for them to regain ground. LeRoy Marsh, Jr. rounds out the top five, 75 points behind Payne. Robert Miller has a firm hold on the Legends division points lead. His gap over second place Anissa Curtice is 30 markers. Anissa’s father, Brad Curtice is third in points, 12 behind his daughter. Brent Mack is fourth, 60 behind Miller and rookie racer, M’Kinzy Usselton lies fifth in the point standings. With only two races left in the Mid City Motor World late model division, the fight for position in each race is going to matter even more. Mic Moulton has a 16 point lead over Jedd Ambrosini. Marty Walsh and Richard Knight are tied for third, 21 markers behind Moulton. Kenny Demello is fifth, 35 out of the point lead. THE RACETRACK: Slightly banked .500-mile oval and one of the fastest tracks in the Northwest. Referred to as the “Martinsville of the West” many NASCAR teams have used the facility in preparation for the tricky paper clip Virginia track. The track has undergone many changes and upgrades over the past year with improved pits and safety walls. This will be the second trip to Spokane Super Oval for the Northwest Super Late Model Series in 2016. Garrett Evans won the first race back in May. “Killer B” Flying High- Braeden Havens is flying high after winning his first career NWSLMS win after capturing the Idaho 200 win at Stateline Speedway. Havens is currently 3rd in the 2016 Championship Standings. The Riddler is Back- Tayler Riddle will make his return to the NWSLMS this weekend after spending the last few months winning some of the biggest races in the Northwest, including Evergreen Speedway’s Summer Showdown and Galloway 150. The Naches, WA Driver has four career NWSLMS wins including last summer’s stop at SCR. Bouncing Back- Garrett Evans will be looking to bounce back after posting his second worst series finish of his career at the Idaho 200 when he finished 19th. Evans still holds a lead on the 2016 Championship and will be looking to add to his three NWSLMS wins this year. SUPER LATE MODEL DEBUT- 15 year-old Brooke Schimmel of Woodland, WA will be making her NWSLMS debut this weekend. She has been running in Legend Cars, Pro 4 Late Models and most recently in the West Coast Late Models. Power Driving- Ryan Wells is coming off an impressive second-place finish at the Idaho 200 that featured him coming from 19th to 2nd place in 40 laps. The Montana native is currently second in the 2016 Championship points. Wells led a majority of the race at SCR in May before falling back late due to handling issues. • Manufacture Race-Through the 25 races that the NWSLMS has been in existence it’s been almost even in the amount of races won by the top two manufactures, but Ford takes the win by capturing 13 of the 25 race wins. Chevy has been the dominant force this year with all five main event victories. Which one will see victory lane this weekend? 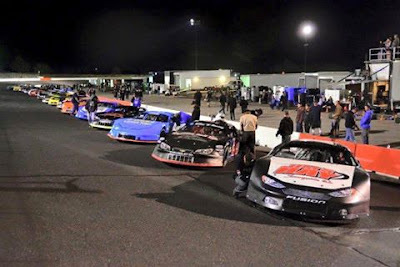 The Northwest Super Late Model Series will head back to Central Washington for the Neal Newberry 125 at Wenatchee Valley Super Oval in Wenatchee, WA. The race, to be held Sept. 10, will honor one of the all-time great racing legends of the Wenatchee Valley and Pacific Northwest. It's back to school night at All American and, to honor the occasion, kids will be invited to participate in a special power wheel race. As for the big boy racing, that action will be provided by the speedway's Street Stock, Bomber, NCMS Sprint and Pro 4 Modified racing divisions. The spectator gates will open at 4pm with the racing going green at 6pm. Adult tickets, age 16 to 60, are $10. Tickets for seniors, age 60 plus, and juniors, age 6 to 15, are $7. Kids 5 and under will be admitted free. The speedway also offers a budget friendly family pack, valued priced at $35, which admits two adults and three juniors. Irwindale will be making a brief departure from their NASCAR sanctioned oval racing this Saturday night by presenting another one of their fun and thrilling Night Of Destruction. This special event is being presented by Pick Your Part and Seidner's Collision Centers, two outstanding organizations who has been long time sponsors and good friends of the Irwindale Speedway. On the thrill seeking agenda will be an all American demolition derby, an Enduro race plus an Enduro Figure 8 race, Skid Plate racing and the always fun to watch Trailer race. However, the Irwindale Speedway hasn't forgotten their oval racing fans and has scheduled a special appearance by the high energy Pick Your Part Late Model Series. The spectator gates will open at 4pm followed by the speedway's traditional on track autograph session at 545pm with the green flag falling on all of this action at 7pm. Tickets for Night Of Destruction are $10 for adults if purchased pre sale. Otherwise adult tickets for Saturday race day will be $15. The pre sale tickets can be purchased online or by visiting the speedway's office at 500 Speedway Drive-Irwindale. Child admission tickets are $5. There's also a $5, cash only, parking fee. WAIT! there's more. On Thursday, August 18th, the back portion of the Irwindale Speedway will be converted into their one-eighth mile drag strip featuring the NHRA Thursday Night Thunder program. Designed as an alternative to illegal and dangerous street racing, this program is open to all types of vehicles from professional race cars to the street car parked in your driveway. The program is also extremely budget friendly. You can race all night for a $20 entry fee or watch them race all night for only $10. The spectator gates will open at 4pm with the five hours of drag racing running from 5 to 10pm. WAIT! There's even more from the Irwindale Speedway during their very busy and exciting weekend. Drag racing returns on Sunday, August 21st, when Irwindale presents round number five of the NHRA Summit Racing Series. Providing the straight line racing action will be the Pro, Pro Bike, Sportsman and Super Pro divisions. The gates will open at 9am with elimination rounds beginning at 1pm. Fans need to call 606 358 110 for ticket and other information. Kern County Raceway will begin the final leg of a very successful 2016 racing season this Saturday when they present Les Schwab Tires Night At The Races. Providing the on track excitement will be the NASCAR Late Models, the Race Car Factory Spec Late Models, the INEX Bandoleros, the 911 Racing Series, the Mini Dwarfs and, for you two wheel racing fans, the Golden Empire Supermoto Series. The spectator gates will open at 5pm followed by the on track excitement at 7pm. General admission tickets are $10. Tickets for seniors, age 65 plus, military personnel and youth, age 6 to 15, are $7. A budget friendly family four pack, value priced at $25, is available and admits two adults and two kids. This event is expected to be one of the hottest tickets of the weekend because it's being highlighted by the always exciting Lucas Oil Modified Racing Series, presented by 1 800 Loan Mart. The series will treat the fans to the Loan Mart 100. The race will feature a 24 car starting field that pays $2,000 to win. It also features an extremely tight championship points battle with a mere single points separating drivers Scott Winters and Matthew Hicks. Also on Saturday night's race agenda will be the Open Late Models, the 1 800 Loan Mart Street Stocks, the Mini Stocks, Bandoleros and the speedway's always fun Barber Pole race. The OSS action begins on Friday night with an open test and tune session for all divisions from 6 to 10pm. Saturday race day begins with a practice session for all divisions at 1255pm followed by qualifying at 315pm. The spectator gates will open at 4pm with the racing receiving the green flag at 6pm. General admission adult tickets are $12. Tickets for youth and seniors are $10. Those prices are a true bargain for the show quality you're going to see at the OSS this Saturday night. The famed Stockton 99 will be treating its fans to a action packed Saturday night of racing featuring their Stockton Late Model, Bomber, Mini Cup and Grand American Modified divisions. The spectator gates will open at 5pm followed by racing at 6pm. General admission tickets, age 16 to 59, are $15. Tickets for juniors, age 11 to 15, seniors, age 65 plus, and military personnel with valid ID are $10. Kids 10 and under will be admitted free. The speedway also offers a budget friendly family pack, priced at $40, which admits two adults and two kids. The Tucson Saturday night begins with hot oval racing from their NASCAR Late Model, Pro Stock and Hornet racing divisions. The night ends with a giant Monster Truck Show featuring high powered, behemoth, trucks grabbing several feet of air while racing against the clock. The spectator gates will open at 5pm followed by qualifying at 515pm and racing at 7pm. Adult tickets for this special show are $15 with junior tickets priced at $10. That's a lot of show for those prices. 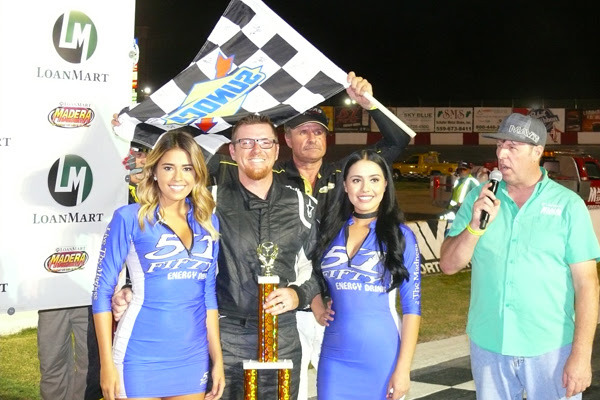 MADERA, CALIFORNIA (August 13, 2016) – Jeremy Doss and Darrin Knight both extended their points leads, taking touring series victories on a busy night at LoanMart Madera Speedway. Doss, from Upperlake, CA, and Knight, from Kelseyville, CA, both hail over 250 miles north of the 1/3rd mile speedway. Doss' win came in the MAVTV-televised Pacific Challenge Series presented by PenneyLawyers.com while Knight won the Sunoco Fuels 60 for the North State Modifieds. Doss' win was his 18th career victory in the series. Jason Romero made his first career Madera start after sweeping both Roseville races this year. He led practice, set a new track record at a 14.162, and proceeded to win the American Racer Tire dash for a set of tires and the pole position. Romero's pole was short lived at the start of the feature as Valley Springs' Tracy Bolin swept around the outside to lead lap one. Romero fell into the clutches of Doss for second in a back-and-forth battle until Doss spun with contact from Ross Strmiska on lap five. Lodi's Matt Wendt suffered a flat right front tire and slight damage trying to avoid the spin. Mike Beeler also was caught up in the incident. Doss took over the lead from Bolin on the restart and Herzog used the restart to get around Jeff Bishofberger for third. Travis Milburn started turning up the heat as he got around Chris Scribner for sixth on lap 24 and then overhauled Shannon Mansch for fifth on the outside on lap 32. The Herzog and Bischofberger battle was very physical with the drivers snaking three-wide through lapped traffic. The long 34 lap green flag run ended on lap 40 for a brief caution. Lap 41 proved to be difficult to overcome with a series of spins. Most notably Matthew Wendt suffered damage when he tangled with Strmiska. Colby Potts suffered heavy front end damage to his Camaro and a few laps later tangled hard with Don Swartz' Mustang for a lap 45 caution. Potts was done for the evening. All the following restarts were single file which gave Doss a cushion over the continuing battling between Bolin and Herzog. Herzog got around on the outside for second on lap 49 to turn his attention to Doss. Mansch spun with contact from Strmiska for a lap 51 caution that set up the battle to the finish. Herzog made his mark, diving inside Doss several times and making contact in turn four to lead lap 55. Doss charged back on the outside to lead lap 56 and would not be deterred as he drove away for a 1.7 second win ahead of Herzog, Bolin, Bischofberger, and Romero for a comeback run to fifth. Knight's win in the North State Modifieds was convincing as he led Charlie Collins in a close duel throughout the closing laps. Nick Lyons started on the outside pole and took the lead from Terry Deal on the initial start. Charlie Collins and Mike Collins navigated the pack from eighth and sixth starting positions respectively. Knight lined up on the fifth row with June 11th North State Madera winner Jason Philpot of Sacramento alongside. Knight was quickly on the move and was up into third on lap five using the outside line. Knight then took over second with Charlie Collins up third behind him by lap ten. Lyons, Knight, and Collins staged a nice battle before a red flag when Benny Moon lost an engine in turn one. Lyons took over the lead on the restart and Collins went to work on Lyons. The battle continued until Lyons was finally shuffled to the outside line and freight trained back to sixth position. At the halfway point of the 60 lap race Charlie Collins was in pursuit of Knight. Heavy lapped traffic in the final five laps of the season allowed Collins within half a second but never closer. Knight got the win over Collins, Philpot, Mike Collins, and Darrin Sullivan. Lyons eventually finished sixth. Kevin Barba won the dash as well. The USAC HPD Western Midgets main event was a 30 lap main event with many twists and turns. Race winner Toni Breidinger had to do her work from the back of the field and it took her several laps to get to the front. David Prickett led early in his guest appearance before a spin that allowed Tom Patterson to take over on lap three. Jesse Love IV stayed close with Patterson for many laps while Breidinger continued to chip away at the field. The exclamation point was a spin by Cody Jessop in the Honda house car on lap 23 that dropped him from fifth place. Breidinger seized the opportunity and took the lead from Patterson on lap 28 to take the narrow half a second victory. Her sister Annie worked her way up to third with Blake Brannon and Antonia Boscacci the top-five finishers. The CSS 360 Super Modified race was abbreviated by mechanical problems but ended up making for a drama filled race. Clovis' AJ Russell was the odds on favorite for the race win after winning both the heat race and qualifying over Bakersfield's Justin Tuey. The main event was again a battle between the duo as Tuey led the opening five laps before Russell took over. Tuey went up in smoke for a caution on lap nine which gave surprise hard charger Donnie Large, Jr. a chance to get Russell. Large went up the inside of Russell several times in a high speed duel that ended when Large's engine blew on lap 12. The race was halted prematurely with Russell, Large, and Austin Carter the final finishers. Lucy Carmona got her second Toyota Sedan victory of the year leading the whole distance of the race with Mike Marley on her bumper. Erik Woods spun out on the 23rd lap of the race to set up a shootout. Carmona had no problems to fight off Marley, while points leader Jilliaun Holden slowed dramatically allowing Woods to snake through for a third place finish as well. The MSTs opened up with wild action which caused DJ Lander to slow to a stop and forced Dennis Brannon to the pits and out of the race. After things settled down it was Kevin Thompson and Bert Stephens anchoring the front of the field. A caution on lap eight saw Rian Bowman bounce off the front stretch wall in contact with Zachary Cook. Another caution gave Bowman time to rejoin the field. Thompson held on for a .410 second win to extend his points lead with Cook coming back to run third. LoanMart Madera Speedway is dark on August 20th before returning on August 27th. The program includes: Race # 6 of the MAVTV Televised $1,000 to win LoanMart Open late Model Series split 50's, Race #5 of the $1,000 to win Twisted Tea Modifieds, Race #5 of the 51FIFTY Jr. Late Model Series 50 laps (split 25's), Race #6 of the Super Hobby Stock Series, MST, Toyota Sedans, 4-Bangers, Mini Cup. Race fans can catch up on LoanMart Madera Speedway action every Thursday with "Madera Racing" on MAVTV at 8 p.m. Eastern / 5 p.m. Pacific. MADERA, CALIFORNIA (August 13, 2016) - 2012 Pacific Challenge Series champion Jeremy Doss picked up his 18th career victory at Madera Speedway on Saturday night, driving away from Clovis' Bryan Herzog for the 75 lap win. The 19 year-old Kulwicki Driver Development Program member extended his points lead by 32 points over 2014 champion Mike Beeler as well. The MAVTV-televised race will air at a later date during the "Madera Racing" program. Jason Romero of Cameron Park made his first Madera start and first PCS start outside of All American Speedway, after sweeping both Roseville races this year. He led practice, set a new track record at a 14.162, and proceeded to win the American Racer Tire dash for a set of tires and the pole position. Doss took over the lead from Bolin on the restart and Herzog used the restart to get around Jeff Bishofberger for third. Meanwhile tenth starting Shannon Mansch of Roseville was up into fifth. Loomis' Chris Scribner led a train of cars for sixth position with Idaho's Travis Milburn in the mix for that position. Milburn started turning up the heat as he got around Scribner for sixth on lap 24 and then overhauled Mansch for fifth on the outside on lap 32. Justin Westmoreland slowed to the pits in his first 2016 PCS start on lap 36. The Herzog and Bischofberger battle was very physical with the drivers snaking three-wide through lapped traffic. The long 34 lap green flag run ended on lap 40 for a brief caution. Lap 41 proved to be difficult to overcome with a series of spins. Most notably Wendt suffered damage when he tangled with Strmiska. Romero was still mired outside the top-ten and made a dramatic three-wide maneuver to try to get around JR Courage. Colby Potts suffered heavy front end damage to his Camaro and a few laps later tangled hard with Don Swartz' Mustang for a lap 45 caution. Potts was done for the evening. Herzog made his mark, diving inside Doss several times and making contact in turn four to lead lap 55. Doss charged back on the outside to lead lap 56 and would not be deterred as he drove away for a 1.7 second win ahead of Herzog, Bolin, Bischofberger, and Romero for a comeback run to fifth. Travis Milburn's drive from 13th starting position to sixth was good enough for the Penney Racing Supply Hard Charger. The Pacific Challenge Series continues on to round #10 on Saturday September 3rd at Stockton 99 Speedway for the third round of the Tri-Holiday Series. MONROE, WASH. – Todd Gilliland dominated the field in the NAPA Auto Parts 150 presented by Toyota to earn his fifth victory of the season and his sixth NASCAR K&N Pro Series West win overall. The 16-year-old Sherrills Ford, North Carolina, NASCAR Next driver led the field to green after winning the 21 Means Pole Award earlier in the day. He paced the field throughout the race to lead all 150 laps at Washington’s Evergreen Speedway. The big battle came from Gilliland’s Bill McAnally Racing teammates Chris Eggleston and Riley Herbst for the runner-up spot, with Eggleston securing the spot with a pass on the backstretch with 44 laps to go. With his win, Gilliland now has a 12 point lead over Partridge in the series championship points standings. Gilliland joins his grandfather, Butch Gilliland, and his father, David Gilliland, on the winners list at the .646-mile oval. Gracin Raz and Ryan Partridge rounded out the top five. While Cole Rouse, Blaine Perkins, Julia Landauer, Nicole Behar and Cole Moore completed the top 10. The NAPA Auto Parts 150 presented by Toyota will air on NBCSN Thursday, Aug. 25 at 8 p.m. ET/5 p.m. PT. 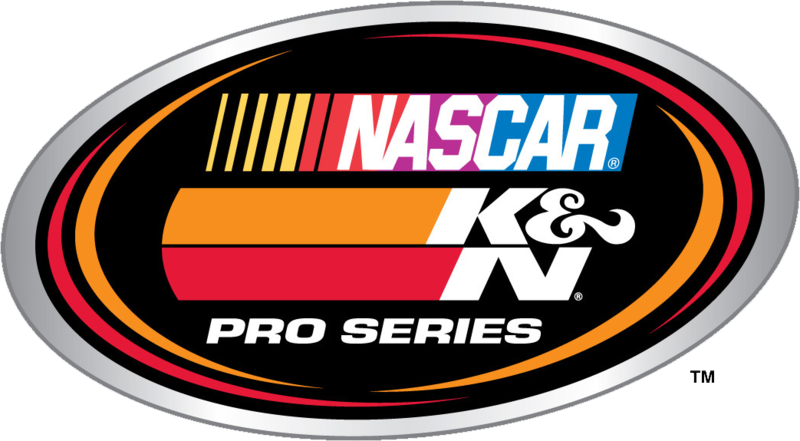 The NASCAR K&N Pro Series West will be back in action Saturday, Aug. 27 at Oregon’s Douglas County Speedway. 1. (1) Todd Gilliland, Sherrils Ford, N.C., Toyota, 150 laps, 65.658 mph. 3. (7) Riley Herbst, Las Vegas, Nev., Toyota, 150. 4. (8) Gracin Raz, Lake Oswego, Ore., Ford, 150. 5. (5) Ryan Partridge, Rancho Cucamonga, Calif., Ford, 150. 6. (13) Cole Rouse, Fort Smith, Ark., Ford, 150. 7. (3) Blaine Perkins, Bakersfield, Calif., Chevrolet, 150. 8. (10) Julia Landauer, New York, N.Y., Toyota, 150. 9. (9) Nicole Behar, Spokane, WA, Toyota, 150. 10. (12) Cole Moore, Granite Bay, Calif., Toyota, 150. 11. (14) Braeden Havens, Spokane, Wash., Chevrolet, 149. 12. (11) Ron Norman, Tucson, Ariz., Ford, 149. 13. (15) Bill Kann, Scottsdale, Ariz., Toyota, 149. 14. (21) Will Rodgers, Murrieta, Calif., Toyota, 148. 15. (19) Jesse Iwuji, Dallas, Texas, Toyota, 148. 16. (4) Noah Gragson, Las Vegas, NV, Ford, 147. 17. (16) Rich DeLong III, Santa Clarita, Calif., Chevrolet, 145. 18. (6) Garret Archer, Maple Valey, Wash, Ford, 125, suspension. 19. (20) Dan Phillippi, Los Angeles, Calif., Toyota, 118, vibration. 20. (18) Takuma Koga, Nagoya, Japan, Chevrolet, 48, accident. 21. (22) Salvatore Iovino, Los Angeles, Calif., Chevrolet, 22, oil leak. 22. (17) Jack Chisholm, Cranbrook, B.C., Ford, 14, overheating. Lap Leaders: T. Gilliland 1-150. 343; 5. N. Gragson, 340; 6. R. Herbst, 332; 7. C. Rouse, 330; 8. J. Landauer, 330; 9. B.
Perkins, 294; 10. R. Norman, 290.